These energy saving recommendations will help your bank account; some will even help reduce the rate of global warming. Direct debit is an effective way of paying monthly utility payments on time and can also save you money. Because utility prices fluctuate so much over time, your monthly bills are unlikely to stay the same each month, especially as seasons (and therefore requirements) change. This means that costs are spread out over the year. In summer you are likely to over-pay and end up in credit for the winter. Paying utility bills by direct debit often works out to be cheaper, as utility companies reward you for sending set, frequent payments. You can even pay quarterly, although this doesn’t save any more money. Check with your energy provider and ask them if is cheaper, and how to set up direct debit payments. The gas and electricity market in the UK is highly competitive. UK energy providers release new tariffs as regularly as 5 per month, to encourage new customers to sign up. This means that regularly switching supplier or tariff can help you to save a lot of money. Switchomatic is an energy price comparison site that allows you to enter your postcode (as well as optionally providing an email address for a bi-annual reminder) so you can compare and change energy provider or tariff. You just need your current tariff details, which would be on your current supplier bills, and your bank details so you can start sending payments. Your electricity and gas will not be cut off. The change over should happen within two to three weeks, when the new provider will start to send you bills. It is so easy. If you are in credit with your supplier when you change - don’t worry. You can claim the money back. However, be aware that you won't be able to switch if you are in debt to the original utility company. Making your home more environmentally friendly will help save a huge amount on utility bills. Not to mention help delay global warming effects to the planet. Innumerable properties in the UK do not take advantage of technologies which exist purely to save energy. Energy saving light bulbs last up to 10 times longer than the preceding, ‘incandescent’, light bulbs. They can be more expensive but some last up to 30 years. Using just ONE saves around £7.50 per bulb per year, according to Which’s Light Bulb FAQ’s. That is nearly £70 per year for a two bedroom property! LEDs (light-emitting diodes) now come in many new bulb styles and tend to bring more value than other energy saving bulbs like CFLs (compact fluorescent lamps) or halogens, which are really quite inefficient. Energy saving light bulbs are available from Amazon UK, most supermarkets and DIY shops. The Energy Saving Trust also has a good article on Energy Saving Light Bulbs to help you choose the right one. Adding insulation is an investment that will quickly pay for itself in lower energy bills. To properly keep warmth in, houses should be insulated from roof to foundations. Older buildings were not so well insulated when built, so it is worth checking if something can be done to improve that. Home insulation will stop heat escaping and keep your energy bill down. Check attic spaces, ducts, floors above cold spaces (like garages) and exterior walls. Keep warm air in and cold air out by ensuring that all windows and doors are made up of an IGU (insulated glass system such as double glazing), are well fitted and properly sealed. You may qualify for a UK grant to help make your home more energy efficient. Heat insulating material around water tanks and pipes (as well as insulating behind radiators) reduces heat lost - meaning you spend less when heating water up. Plus hot water stays warmer for longer. A jacket for a hot water tank costs around £20, and they are really simple to fit. Check out this hot water cylinder jacket from Wickes. Pipe insulation exists in the form of foam tubes that cover hot water pipes. You just need to buy the correct size from a DIY shop. We found some pipe insulation examples on Screwfix. Fitting radiator reflector panels to external walls, just behind the radiators, helps to reflect heat back into the room instead of letting the heat out through an external wall. A boiler change is an expensive job but can really help to seriously reduce energy bills, if you intend to live in the property for a long period of time. Condensing boilers are now fitted in homes, which are water heaters fueled by gas (or oil). They are highly efficient because they condense the water vapour in exhaust gases, recovers heat and sends cooler gases up the flue. According to The Energy Saving Trust heating accounts for 55 per cent of a utility bill. So upgrading to a new, more economical boiler will really help you to save money on energy bills. Mains gas is currently the cheapest fuel to feed the a domestic boiler, so the sooner you fit a new boiler, the more return you will gain. Installing technologies that harness renewable energy will also reduce your gas and electricity bill. Feed-in Tariffs (FITs) is a UK government scheme to encourage property owners to install small-scale renewable and low-carbon electricity generation technologies. Installation of solar panels (roof mounted or stand alone), wind turbines, a hydroelectricity system (water) or micro CHP (combined heat and power) technology will reduce your carbon footprint and your energy bill. You could even be paid by your energy supplier for energy that you harness. These systems may at first seem expensive, but are worth the savings over the years. Smart meters are electronic devices that records use of electricity and gas, so that firstly you can monitor consumption and billed in accordance. Meaning no (or less) home visits from your supplier. A display, attached to a wall, will let you know, pound by pound, how much energy the household has used and enable you to make savings. You should not be charged for smart meters, as they should be included in your bill, just like the old meter readers. Using less energy in the home can seriously help to reduce gas and electricity bills. Here are a few ways to help save energy. Gas (or even oil) use for home heating accounts for about 50% of gas on a chargeable energy bill. Try turning the heating down just a couple of degrees to save money, and save the planet. If you get cold wear more clothes around the house like a jumper and a good pair of slippers - we love North Face Mules. Specially made base layers such as thermal t-shirts and leggings can be worn under clothes and are very comfortable. When boiling water for cooking purposes, like vegetables, always use the pan’s lid. This keeps heat inside the pan where it is meant to be, instead of letting escape into the atmosphere, along with your gas and your cash. Favor the shower over bath time, as showering usually means that you use less water, depending on how long you shower for. A bath will use between 110 and 190 litres of water, where as a 10 minute shower with a low-flow showerhead uses around 90 litres. Reduce your shower time, and turn down the temperature of the shower, just a bit (it is better for your skin anyway) and you stand to make huge savings. We love Water Footprint Calculator’s post on water saving tips - especially the idea of a bucket to catch water as it heats up, to use for watering plants. Every time you leave a room, turn the lights out too and train the children to do the same. There is no need to have lights on all over the house, and doing so pushes your electricity bill up. Energy saving light bulbs also really help here, see the note above. Timer plug sockets can help with table lamps and are also a good security feature if you go away, rather than leaving a light on the whole time period. If you are so inclined, use smart (energy saving) light bulbs that can be programmed to turn on or off. You can also remotely switch them, so if you remember you’ve left something on when you are at work you can turn it off. Smart plugs can also be used for table lamps, stand up lamps and fairy lights. Reduce the amount of times you need to use your dishwasher or washing machine by making sure that they are fully loaded on each and every wash.
Over time this will save on loads and consequently on energy bills. Is it really necessary to tumble dry your washing? Avoid the tumble dryer and save on your energy bills. Hang washing outside on a sunny or windy day to use natural resources to dry your washing. When hanging inside, try using the same room as the boiler for some warmth. Be sure to open a window regularly to keep you or home well ventilated, this prevents mold when hanging washing indoors. Overfilling the kettle time and time again increases the cost of your home energy. Boil only the amount of water you need at any one time. Kettles are now available with temperature controls, so you needn’t always boil the kettle. If making coffee or a herbal tea water does not need to be 100°c. 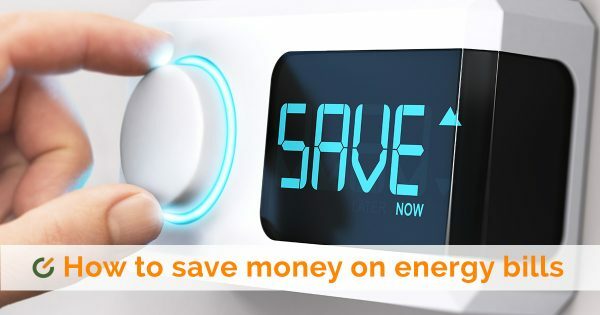 Switchomatic hopes this helps you to save money on your energy bills at home. Don’t forget to switch energy providers regularly to reduce utility rates.